Photo of the Week.. 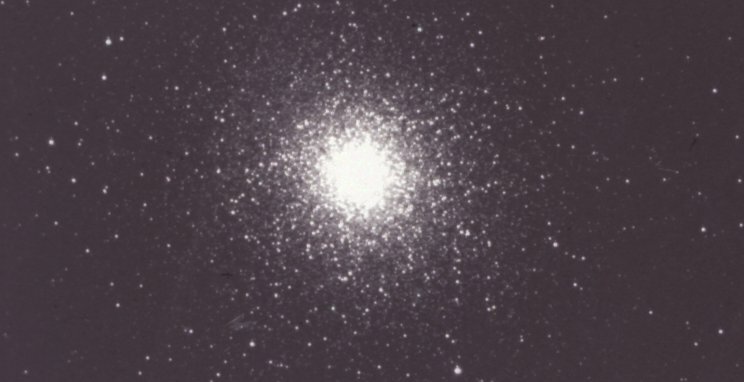 The great globular star cluster M 13 is barely visible to the naked eye in Hercules. (University of Illinois Prairie Observatory). Astronomy news for the week starting Friday, June 28, 2002. The Moon wanes through its gibbous phase during most of the week, and reaches its third and last quarter for this cycle on the morning of Thursday, August 1, the Moon then seen high to the south at daybreak. The day before, our lunar companion goes through its apogee, where it is farthest from the Earth along its orbital path. The combination of the phase, apogee, and near-aphelion for the Earth will produce especially weak tides at the coasts, as the solar tide fills in the lunar at the quarters, and tides are very sensitive to the distances of the tide-producing bodies. Venus and Saturn bookend the night, while the outer planets bookend the week. As the evening sky darkens, Venus shines brilliantly in the west, and as morning twilight begins to light the sky, Saturn shines softly in the east, still among the stars of Taurus well to the east of Aldebaran and the Hyades. Jupiter is following along, and will join the dark pre-dawn skies before long. On the morning of Friday, July 26th, the Moon will pass a few degrees to the south of Uranus, which hovers near the Capricornus-Aquarius border, while Neptune -- deep in Capricornus -- reaches opposition to the Sun on Thursday, August 1. The giant outer planets have been oddly paired for some time now, Jupiter and Saturn still close to each other, the closer one, Jupiter, pulling away from Saturn. Uranus and Neptune are doing the same thing, but at a glacial pace, Uranus creeping away from its outer near-twin. With August comes the height of the summer constellations and the glory of the Milky Way. Begin with the two great birds of the northern sky, Cygnus, the Swan, which flies high above at midnight, and to the south of Cygnus, Aquila the Eagle. Each contains one of the stars of the Summer Triangle, Deneb of Cygnus, Altair of Aquila. The third, Vega of Lyra, glows brilliantly to the west of Deneb. The Milky Way pours down through Cygnus, where the Great Rift breaks it in two, the rift not an absence of stars but a vast complex of interstellar dust clouds. The brighter eastern branch cascades through Aquila and then down through the modern constellation Scutum and into Sagittarius, where the river of stars thickens around the nucleus of the Galaxy. Over 25,000 light years away and buried deeply behind dust clouds, the Galactic Center is believed to be a massive black hole containing over two million times the mass of the Sun.